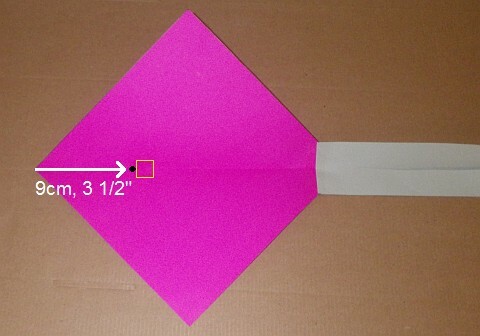 Make A Minimum Tetra Kite - A Paper Single-Cell Tetrahedral! 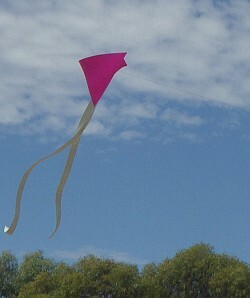 Presented here are a number of rather easy steps showing you how to make a minimum Tetra kite. That's right - a very simple, single-cell tetrahedral. 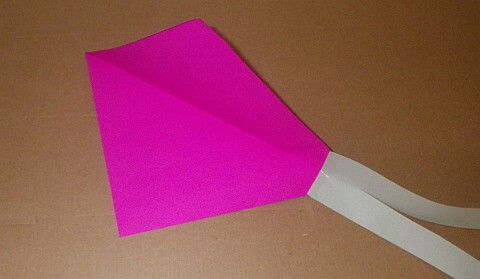 As such, the kite does require some tail but I have ensured that the tail is also very simple and easy to make from paper. The design clearly needed a tail, so I ducked back inside and came out again with a generous amount of paper hanging off the lower corner of the sail. However, the kite still seemed rather limited in it's willingness to climb and stay up. It was time to tweak the design a little. After lightening and lengthening the rolled-up paper cross-piece somewhat, the little kite started to behave! At a nearby grassy reserve, the tiny Tetra proved that it would indeed fly well in gusty Moderate wind. The MBK Paper Diamond, another design, could be considered the 'big brother' of the Minimum Tetra presented on this page. The Tetra actually looks very much like a Diamond when in flight! When you've had a bit of fun with learning to make a minimum Tetra kite, try the more advanced Paper Diamond which will fly higher, longer and generally somewhat steadier, in similar wind conditions. Also, it will stay up in much lighter wind! So cheap and simple - but it flies! 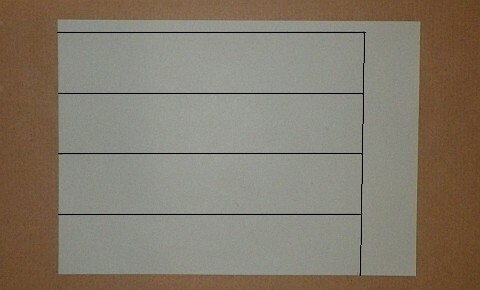 2 sheets of plain copier paper. A4 or Letter size. 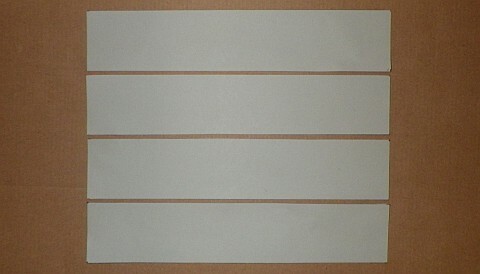 18mm (3/4") clear sticky tape. In a dispenser preferably. Narrower tape should be OK as well, if that's all you have. Any polyester sewing thread, preferably the lightest available. The lightest Dacron or Nylon flying line you can get your hands om should also do a good job. The tool required is anything with a sharp point, to poke a hole in paper. In fact, I got by with a ball-point pen! 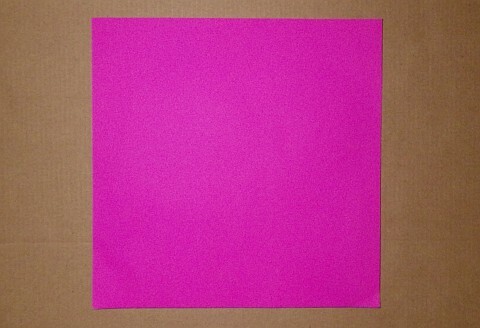 Select a sheet of copier paper in the desired color. Measure and mark dots as indicated in the photo. The dots have been enhanced in yellow to make them easier to see. A double-check... Measure from the dot at top-right, down to the dot below - the one on the edge of the paper. Shift the dot at top-right a little, if necessary, to make the distance between the dots exactly 20cm or 8". Connect the dots using ruler and pen. The lines have been enhanced to make them easier to see. Square cut - keep the off-cuts! 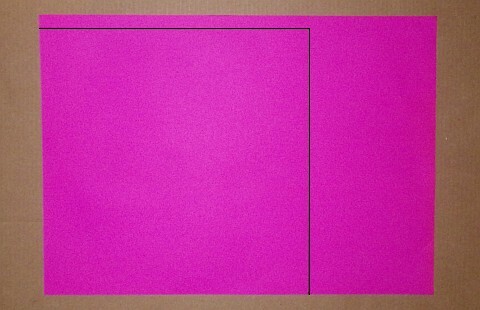 With scissors, cut out the square of paper as shown. Sail's done! Connect the dots using ruler and pen. The lines have been enhanced in the photo to make them easier to see. With scissors, cut out the rectangles. Tape the 4 rectangles together, end-to-end and on both sides. A little overhang is OK - just fold any excess tape around to the other side. 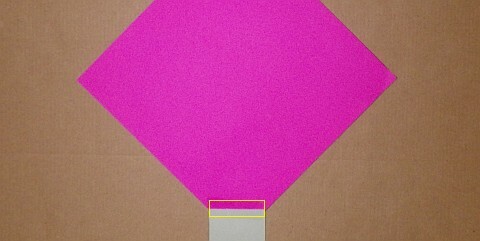 The tape position is shown in yellow, on the photo. Take one end of the tail and line it up with one corner of the square sail as shown. Sticky tape the tail in place. The yellow lines in the photo show where the tape goes. Add another 2 short strips of sticky tape where shown. 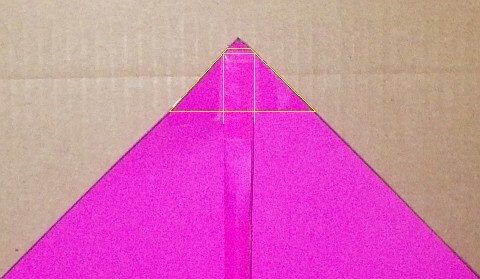 See how the overhanging corners of tape are folded around. With scissors, carefully snip right down the middle of the tail. Go all the way to near the corner of the sail, although that's hard to see in the photo. If you want to, go a little crazy and scissor-cut a wavy or zig-zag line instead! But keep the cutting near the middle of the paper all the way. Firstly, crease the sail paper sharply from the nose end corner right down to the corner where the tail attaches. Measure 9cm (3 1/2") from the nose corner back along the crease and make a hole in the paper at that point. See the black dot in the photo. Lay down a square of sticky tape so that the edge closest to the nose corner of the sail is right next to the hole. See the yellow lines in the photo. Lay down a second square of sticky tape over the first one. One wasn't enough after some hard flying, I discovered! The off-cut from making the sail should be big enough to use for the cross-piece. 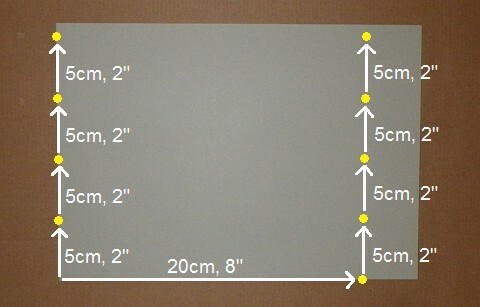 Measure and mark dots as indicated in the photo. Try to be reasonably accurate, as the strength and length of the cross-piece is what holds the correct sail shape in the air. Connect the dots using ruler and pen. With scissors, cut out the rectangle. Put a tiny fold all the way across a long edge. Then keep folding up the rectangle fairly tightly. 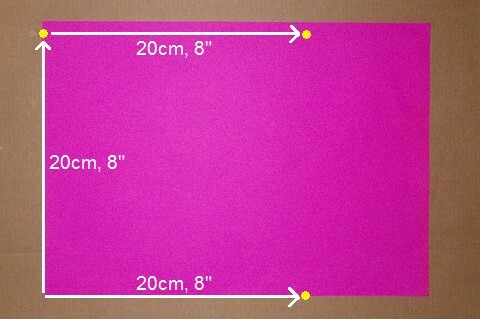 Stop the paper from un-folding by wrapping a 3cm (1") length of sticky tape around the middle. Also wrap tape at 4 other places as shown by the yellow lines in the photo. The piece of folded paper is probably fairly flat, so squeeze it here and there until it pops into a more circular shape. Make it like a rod rather than a ruler! Rolling it between your hands can also help the shape become circular. 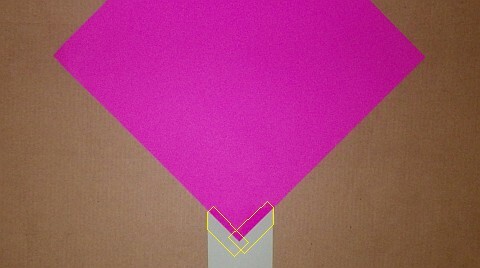 Flatten the cross-piece at one end and line it up with a side-corner of the sail as shown in the photo. Skip down to the next photo for a moment, if necessary! The end of the cross-piece is highlighted in light-gray to make it easier to see. Secure the cross-piece in place with a 3cm (1") strip of sticky tape. Fold the overhanging corners of the tape around to the other side. See the yellow lines in the photo. In the same way, attach the other end of the cross piece to the other side corner of the sail. See the photo. 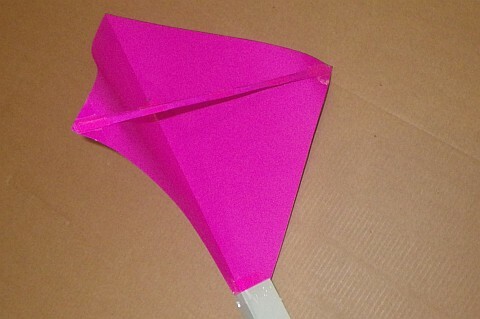 You have pretty much finished learning how to make a minimum Tetra kite at this point! Assuming you have some polyester sewing thread wound onto something already.. Unwind a short length of thread and poke the free end through the hole in the sail, as shown. One way to get started is to lay the thread across the hole then poke a pen or pencil tip through - taking some thread with it. Pull 4cm (1 1/2") of thread over the square of sticky tape next to the hole. Stick down the thread with enough sticky tape to cover the hole and all the thread. See the photo, which shows the position of the longer piece of sticky tape. The hole is on the left. That's the kite all done and ready to fly. All that remains is to go out when there's a fair amount of breeze and watch the little Tetra do it's thing! Floating steady or zipping around, depending on the strength of the wind. You will need to wait for winds of between 12 and 28kph (8 to 18mph) for best results. The kite will be easiest to launch down at a beach - but don't get it wet! You will do best if you use ordinary polyester sewing thread for the flying line. 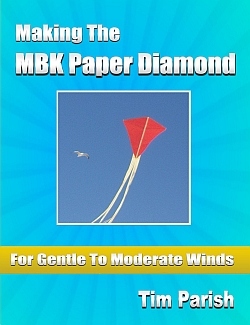 Try the MBK Paper Diamond too, which will fly in wind speeds of 8 to 28kph (5 to 18mph). A useful wind range indeed!